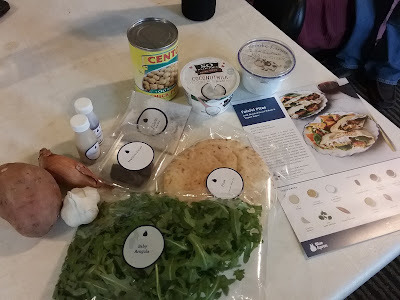 Today I'm reviewing another Blue Apron dish for A Witch's View. We're looking at Falafel Pitas with Roasted Sweet Potato & Yogurt Sauce. Blue Apron offers fresh non-GMO, sustainable seafood and meats with no hormones or antibiotics. They don't however, offer dairy free. That is why ultimately I switched from Blue Apron to GreenChef. Over the next 3 weeks, I'll share my meals that I picked up from there and compare them to Blue Apron. 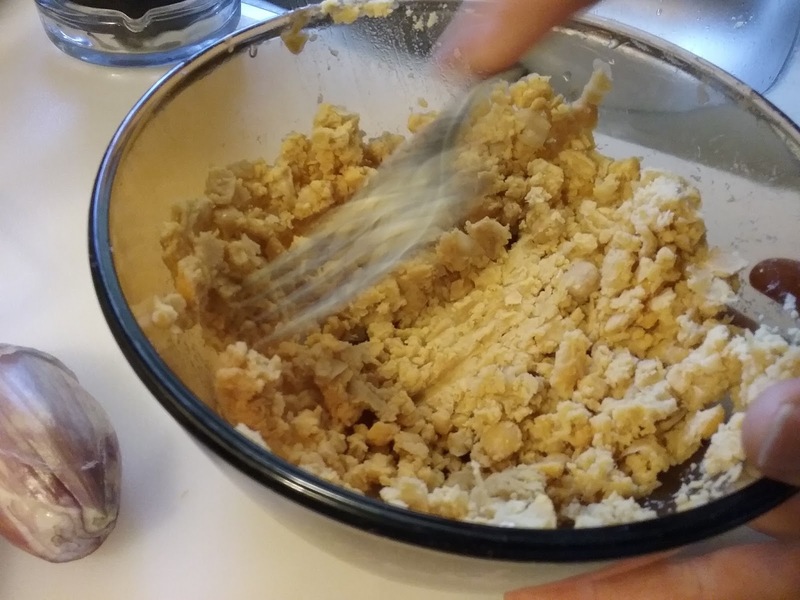 Everything comes in the exact measurements that you need to complete the dish. Before you freak out about waste, Blue Apron offers a recycling program. So far this was my favorite dish from Blue Apron. I'm a huge Falafel fan but usually eat it drenched in Tzatziki sauce. Since switching to vegan, I have not found a really great way to make the sauce and have since given up on my falafel. Until now! This was a really great dish. Because Blue Apron does not offer dairy free options, I had to use my own yogurt for this dish. I used So Delicious Coconut Milk Yogurt instead of the Greek Yogurt that came with the basket. I started out by draining and washing the chickpeas and washing/peeling the veggies. Mise en place! 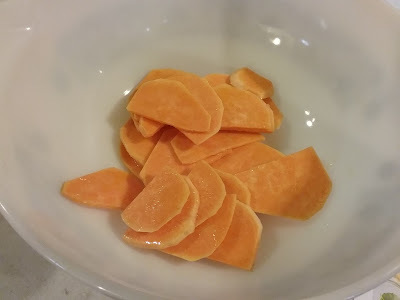 Next I sliced the sweet potatoes thin and got those in the oven with just a little olive oil and salt and pepper. While they were roasting I added the garlic, dates and sauce to the chick pea mixture and pan fried those until they were golden on each side. 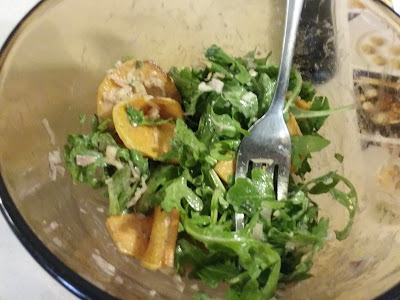 After the potatoes were finished cooking I added them to the salad, the shallots and the sauce. Next was assembly. 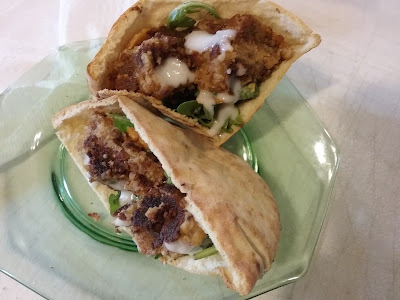 I put all the yummy goodness into the warmed pita bread and it was divine. The sweet potato and the arugula was fantastic. 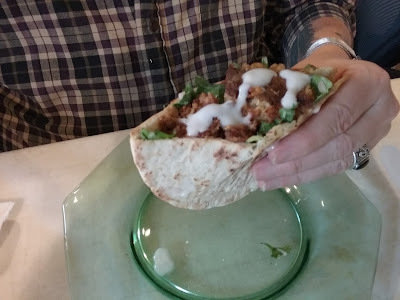 The bite of date mixed with the falafel spices was simply amazing. This is one of my favorite dishes. I hate arugula. Hate. I had never had a date until today. The combination was amazing. I highly recommend this dish. Even my hubby who HATES falafel (How is that even possible?) loved this meal. We were very pleased with this one. 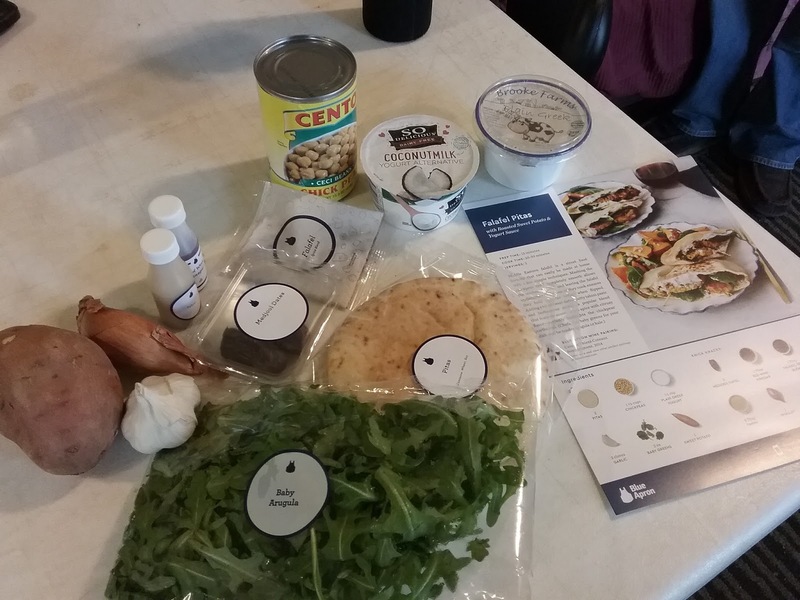 Go Blue Apron! Next week I'll be switching companies and doing reviews for GreenChef. Stay tuned!